Posted on May 12, 2007	by Linda S.
Wonderful to use as a binding around small projects, to embellish embroidery, or as the cording for purse handles etc.. I found this easy way to make strong cords irresistable to work with. 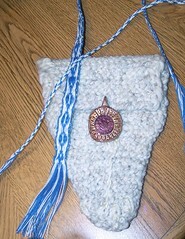 The tiny blue and whitecord in the picture is done with the basic fingerloop braiding technique shown here on Phiala’s String Page. It was done with crochet thread, but I have also braided sewing thread that turns out wonderfully. For a closer look at the small braid, click on the picture and it will take you to my Flickr page where it can be increased in size. Added note: I just found that Phiala has started a new blog called String Notes just this month! On it, she is discussing her knitting and gardening… drop over and say hello! This entry was posted in Crafts, Free Patterns, Handcraft, Handwork, Historical Textile, Knit, Needlework, Tutorials. Bookmark the permalink.